Note: This is the first article in a two-part series on diving boards. When buying or remodeling a swimming pool, one important consideration is whether or not to include a diving board. This decision should be a calculated choice based on your pool design, backyard space, and family lifestyle. Diving boards can serve as an enjoyable recreational feature on backyard pools. Years ago, most backyard pools were built with a deep end—typically 8-feet—and a diving board. However, over time, their popularity has waned: A few decades ago, the majority of residential pools had boards; but today, that trend has almost completely reversed. Several factors are motivating pool buyers and owners toward passing on this accessory. One is concern over pool safety. In rare, but serious cases, diving accidents do occur—typically with tall divers or those who may be intoxicated and take wild jumps off the board. 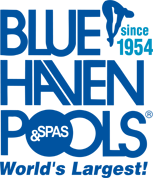 It is worth noting that while some pool professionals express legitimate concerns about diving pools, some consider diving board to offer advantages on the safety front. 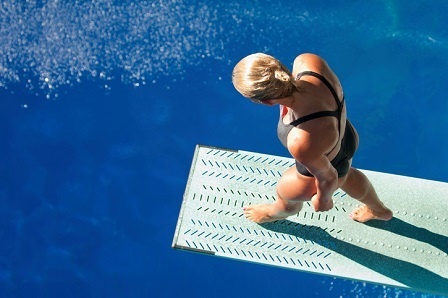 One example why: Less than 10 percent of all swimming pool diving injuries involve a diving board, according to the Spinal Cord Injury Information Network and the University of Alabama at Birmingham. In fact, one of the surest ways to recognize which end of a pool is the deep side is by looking for the diving board, which visually demarcates the deep end. By doing so, swimmers see where to jump into the pool. The point here that some professionals make is that without a diving board, swimmers do not know where the deep end is. As a result, they may accidentally jump from the side of the pool into what turns out to be the shallow end—where they could hit the wall or floor and get injured. Using a diving board can enhance safety in another way. Jumping off one helps divers clear the edge and walls of the pool. That helps ensure space to dive and helps divers hit the water at its deepest point­­—where it’s the safest to submerge at high velocity. Despite the trend toward board-less swimming pools, some families cannot envision building or remodeling a backyard resort without one and the enjoyable activity opportunities it provides. Whichever way you are leaning, you will want to weigh additional factors during your decision-making process. Even if diving boards provide certain benefits, other practical factors have led to fewer diving pools being built. Many homeowners—at the recommendation of their pool contractor—opt for pools that do not have a traditional deep end on one side. The move toward these board-free pools has been to so-called “sports pools.” These are also known as a “3-5-4” design (or a slight variation of these dimensions). A sports-pool depth configuration includes dual shallow ends and a deeper section in the middle. However, even this “deep” end ranges only five to six feet. The sports pool name comes from the fact that these dimensions are perfect for stringing up a volleyball net across the center deep section and for players to be able to stand on both sides of the net for a game. Another factor driving the shift away from diving pools is how they limit the usable area in a pool. A diving pool configuration requires a diving well that’s at least 8-foot deep to create a safe environment. It also needs to be built with a strategically graduated slope stretching from the shallow end to the deep area. As a result, the shallow-end space is limited. There is simply less usable “play area” for pool users, as they cannot stand or walk along the deep section with their head above the water’s surface. This factor is particularly important if you have young or short children who will be using the pool. Another deterrent for some pool buyers is the financial aspect. Pricing concerns come on two fronts. One is the initial purchase price. Including a diving board adds to the cost. First, there is the price of the accessory itself. Second, the construction of a pool’s deep end drives up costs; a deep end requires additional labor—such as greater excavation, additional steel for reinforcement, and more materials, such as concrete and plaster for the larger surface area. The second area impacting finances is the pool’s ongoing maintenance costs. Because a diving pool requires more depth than a shallow one, the overall volume of water contained is greater. More water volume translates to slightly higher costs for heating and sanitizing. Also, with more gallons in the pool; equipment has to work harder; your pump must run longer to power filtration and sanitizing equipment, and your heater must run longer to boost the temperature. Even if you make the deliberate decision that your family wants and would use a diving board with your pool, your backyard may dictate otherwise. A diving board—and the accompanying requisite deep end and graduated slope—ultimately mandates a larger pool. So, before you promise a board to the kiddos, check with your pool builder if your backyard is big enough to allow for a diving pool. Small lots don’t work for diving pools, which gobble up space. Diving pools must be at least 34 feet long—ideally 36 to 38 feet. That’s because its total size must break down to roughly one-third for the diving well, one-third for the graduated slope, and one-third for the shallow end. The diving well alone must be approximately 8 to 10 feet deep. Such depth is required to prevent injuries when entering the water from a dive—particularly for tall swimmers. The slope goes from deep to shallow, and it’s critical for protecting stronger divers who soar away from the diving board into the water at a greater horizontal distance. Now, if your pool is 36 feet long, that leaves only about 12 feet for the shallow end. And the shallow end is where—on average—most swimmers spend 80 percent of their time while in the water! The board’s position is also a factor. In most cases, a diving board must be installed 10 feet away from all obstructions. These include the side walls of the pool and features like love seats and tanning ledges. Having a board also dictates the area in the pool where you can build entry steps. Another consideration: However long your swimming pool is, you’ll need additional backyard space to build decking (and additional requisite drainage) around it to support the diving board base—and to create a usable patio area you likely will want. For example, if you choose a typical 6-foot diving board, four feet of the board will need to extend over the deck. Be aware that you must secure the board’s base or platform into concrete. Concrete provides the needed strength and durability to secure the board’s base to keep it stable and safe. Now what this means is that there may be some extra challenges or limitations when it comes to choosing deck material options. A wide variety of attractive concrete finishes—such as stamped, decorative, and salt-finished are available. You can have other materials, such as natural stone or pavers. The caveat: Your builder will need to pour a concrete section first to secure the base, and then cover or surround it with your preferred deck material. Diving boards can add fun to your pool and serve as an invitation to jump into the water around it. For some homeowners, they feel that a swimming pool just isn’t a true aquatic playground without some diving board. In the right setting and with proper pool construction, diving boards can be a terrific addition to creating a private aquatic playground. When properly installed and maintained—along with rigorous enforcement of safety rules—they can be an exciting source of fun and exercise for your family.